Music stars Reba McEntire, Chris Stapleton, Lady Antebellum and Wynonna Judd have been added to the momentous lineup for "All In For The Gambler: Kenny Rogers' Farewell Concert Celebration," an all-star concert event taping at the Bridgestone Arena in Nashville, Tennessee on Wednesday, October 25, 2017 at 7 PM CT. In addition, The Judds (Wynonna and Naomi Judd) will reunite for an unforgettable performance. The new additions to the lineup will join previously announced artists Kenny Rogers, Dolly Parton, Little Big Town, Alison Krauss, The Flaming Lips, Idina Menzel, Jamey Johnson, and Elle King. A portion of the proceeds from the show will benefit the T.J. Martell Foundation and the Kenny Rogers Children's Center. This once-in-a-lifetime concert event will honor Kenny Rogers' historic 60-year career and will feature the final performance together by Kenny Rogers and Dolly Parton. In a career that has spanned more than six decades, Kenny Rogers has left an indelible mark on the history of American music. His songs have endeared music lovers and touched the lives of millions around the world. 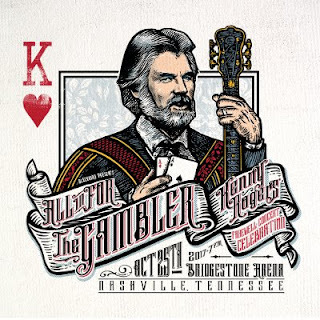 Chart-topping hits like "The Gambler," "Lady," "Islands In The Stream," "Lucille," "She Believes In Me," and "Through the Years" are just a handful of Kenny Rogers' songs that continue to inspire new generations of artists and fans alike. Rogers, with twenty-four number-one hits, is a Country Music Hall of Fame member, six-time CMA Awards winner, three-time GRAMMY® Award winner, recipient of the CMA Willie Nelson Lifetime Achievement Award in 2013, CMT Artist of a Lifetime Award honoree in 2015 and has been voted the "Favorite Singer of All Time" in a joint poll by readers of bothUSA Today and People. Blackbird Presents' Keith Wortman, creator and executive producer of Nashville's recent highly acclaimed "Sing Me Back Home: The Music of Merle Haggard," is the creator and executive producer of "All In For The Gambler." GRAMMY® Award Winner Don Was will serve as music director, and preside over a stellar house band backing the performers at this historic concert event taping. Kenny Rogers' manager, Ken Levitan, also serves as executive producer. The event will be filmed and recorded for multi-platform distribution throughout traditional media (worldwide broadcast, music, and digital). "Like millions of fans around the world, Kenny Rogers has been the soundtrack of my life. As he finishes out this beautiful victory lap of touring life, I am honored and privileged to create and produce a show celebrating this special artist on this monumental occasion." says Keith Wortman, CEO of Blackbird Presents.